Including Equestrian Activities at an Event: It’s Easier Than You Think! 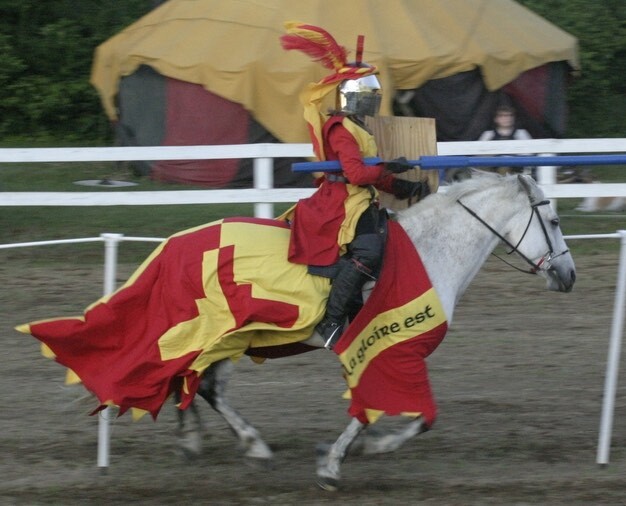 ≈ Comments Off on Including Equestrian Activities at an Event: It’s Easier Than You Think! The Gazette thanks Mistress Eleanor Fitzpatrick for writing this article at our request for our series of background articles on the East Kingdom and the SCA. Few things evoke the feeling of living in the past quite so easily as the sight of a caparisoned horse charging down a list, rider with lance at the ready. While actually becoming a rider or owning a horse of your own involves a significant outlay of both time and money, having equestrian activities at your event is surprisingly easy. Mostly what equestrians need is space, and the proper paperwork done. We bring the rest. We are very self-sufficient, sometimes so much so that you don’t even realize we’re there! We use a lot of specialized targets, stands and lane markers. We don’t expect a site to provide us with anything more than few hay bales to stab and we can even manage without those. Our own horse-containment systems. While we LOVE it when an event can provide us with a horse barn to use, not all barns are suitable for horses, particularly at fairgrounds. More than one horse has demonstrated his ability to simply walk through the walls of a pen designed to hold goats. For this reason, most owners bring portable stalls for their horses unless we know for certain the site has horse stalls available for our use. Our own marshals/scorekeepers/list ministers. You do not need to have horse-knowledgeable people on your event staff, you just need someone to act as liaison between the autocrat staff and whichever equestrian marshal is assigned to your event. There is always room for someone who wants to come help us keep score, or herald the competition but we do not require the hosting group to be able to provide those things for us. A competition field We don’t need a perfect, groomed riding arena. A mostly flat, mostly level field that isn’t muddy or rocky or full of holes will do. If it has a fence, great! If not we can set up boundary ropes to help define where spectators should be vs the active competition area. 75 feet by 150 feet is a good minimum size, though we’ve been able to work with slightly less if it has permanent barriers (fencing or trees) on at least two sides. This does NOT have to be a separate field from the main area of the event as long as the field is large enough to share safely. In fact, we prefer to be part of or adjacent to the main event area if at all possible. Water. We bring our own buckets and a small amount of water with us, but we cannot transport enough water to last an entire weekend. A horse can drink as much as 20 gallons per day when it’s hot, and 10 gallons per day is the minimum amount of water that should be provided to each horse. A hose near the horse area is fine. Lakes or streams don’t count. Somewhere to dispose of manure. We bring our own tools, and we clean up after the horses ourselves, we just need somewhere to dump the output. This can be a dumpster rented for the purpose or a dump pile on site. Most garbage collection companies rent manure dumpsters to farms – just be sure to specify that you are looking for a quote on a manure dumpster, not a trash dumpster. They’re often considerably cheaper than trash dumpsters because the company can sell the manure as compost. Trailer parking. Horse truck and trailer rigs are not as big as semi-trucks but they’re easily the largest vehicles on site at most any event and they need a good bit of room to turn and maneuver. This does not need to be near the regular parking, but near the horse area is a bonus. A clear emergency lane from the equestrian area to the road off-site. If a person is injured, the paramedics can bring in a stretcher if they can’t get the ambulance right there. If a horse is seriously injured, we must be able to get a trailer right to where the horse is. Luckily a horse injury that severe has only happened once in all the years we’ve had equestrian events in the East but it made a mighty big impression on those people who found their tents being torn down in a big hurry so the emergency trailer could get through. Room to overnight horses. This one applies primarily to camping events but you’ll get more horses attending a single-day event if there is somewhere for them to stay overnight nearby. Unlike us, horses can’t ride in the trailer for 6 hours, compete all day and then trailer home another 6 hours. If there is a suitable horse barn, we don’t have to camp right next to the horses, though we like to. If we’re using portable pens we absolutely must camp with the horses so we can supervise them, both so that we can keep them contained and so we can keep them and you safe. Plan on 20’x20’ per horse for portable pens, plus space for walking lanes between them. For single day events it sometimes works to set up overnight pens on the same field as will be used for competition. Proper paperwork. Any SCA function that has horses at it as part of the event must activate the equestrian insurance rider whether the site requires proof of insurance or not. The insurance rider is $50 and instructions for ordering it can be found at http://sca.org/docs/insurance.html. Additionally, every single person that enters the event must sign an equestrian waiver at the gate. Promising not to go near the horse area is not sufficient. In the case of an accidental escapee, the entire event may end up being “the horse area” for a short period of time. We hope that doesn’t happen but the waiver covers the SCA in case it does. There’s a very funny story about the time several of the horses escaped the pasture at Panteria and visited the royal feast. That was probably the last time we ever trusted the permanent fencing at a site without inspecting every linear foot of it first!